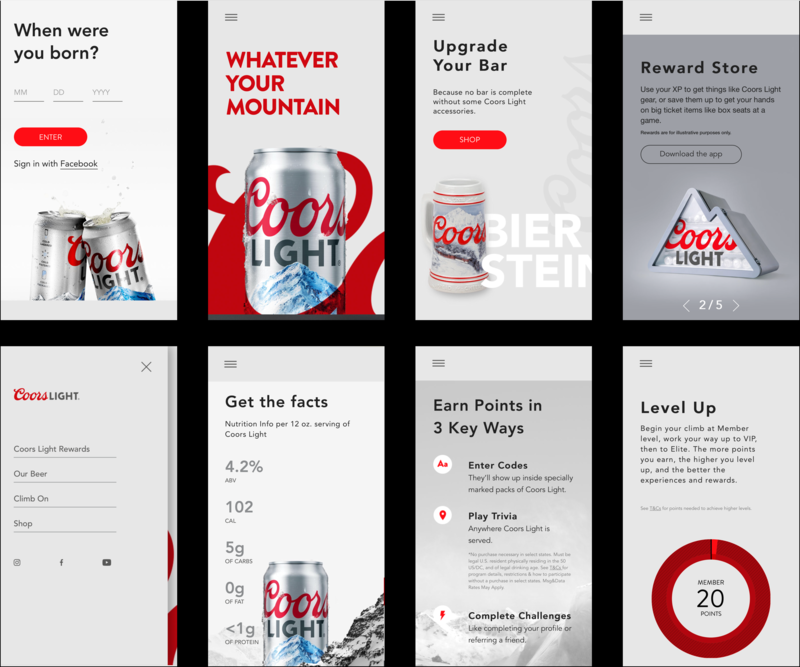 Coors Light has not updated their digital presence since a couple of decades. With that in mindwe pushed the brand to venture out of their silver and bold red type, by adding some color into theirlifestyle photography, while simplifying their website by clearly separating their history, product and retail stories. I have later found out that this visual approach inspired Coors Light to do some rebranding with their print and film campaigns pushing the use of color even further. As a designer it feels great to feel part of something like that. We lead the typography design with their existing red and bold headline treatments. By balancing that branding element with different headline, subheads and body copy treatments we were able to create hierarchy throughout the whole platform, while keeping it responsive to all screen sizes. We also kept the classic feel of the Coors Light brandimng by using the script of the logo combining it with lifestyle photography and product shots. To keep all digital platforms visually integrated, all interactive elements were created and repurposed across the web experience and mobile app. Any new element created was mindfully designed to fit into the existing system.